400 Degrees moved from the little triangle lot on Clarksville Hwy to a downtown location on the corner of 4th Ave S and Peabody inside the Quiznos Food Court. Aqui Simpson has added in Saturday hours from 4 pm - 9 pm for that dinner hot chicken you might want over the weekend. Tuesday thru Thursday 400 Degrees is open 'til 7pm and Friday 9 pm. And she remains closed Sunday and Monday, same as before. At this location, 400 Degrees share a space with Quiznos, Apollo Grill and Primo Pizza. There is a nice clean food court dining room, a tv with the latest sport event, there are clean bathrooms, there is a nice drink and condiment station, and there is a table with ever magazine you could possible want to see from Baby's Monthly to Yachting and everything in between. How fun! What a great place to take in a little lunch and catch up on the lastest Elle magazine or lastest Car and Driver. On Saturday, conveniently, 400 Degrees is open until 9 pm, and during 1st Saturday Art Crawl the Lost Boys Gallery just 1/2 block away is also open until 9 pm. So, this past Saturday, I put my order in for some hot chicken and hot pork chop, and then took a stroll down to the Lost Boys Gallery to check out some art. I saw some clay gazelles that are Xmas ornaments that I like a lot, so I asked the young artist if he could create some more of those cuties for me by next month. Then I walked by up to the 400 Degrees and picked up my meal to go. This was a perfect Saturday evening, lovely Lost Boys artists and art, and a hot spicy chicken to round out the evening. Seriously, there is no trickery or added red color to the photo above of my hot chicken. All I did was shrink the photo, add my blog address and post the photo on this blog. 400 Degrees hot chicken is red red red red read hot. I really like chicken wings, and I really like 400 Degrees 200 Degrees chicken wings. How it works at this hot chicken joint is that you can get 4 types of spicy hot chicken. You can get 0, 100, 200 or 400 degrees. I am not a fire eater, so 400 is out. I tried a lick of the 400 once, and it burned like a SOB, and I just could not drink enough milk and water to make it go away. Then, there was the action of touching my tearing up eyes with the fingers I touched the 400 degree chicken with... and my eyes started to water and burn for many many minutes. No need for me to experience pepper spray to the eyes, I have tried 400 Degrees hot chicken. 200 is as hot as I can go, and the photo shows what 200 degrees looks like. 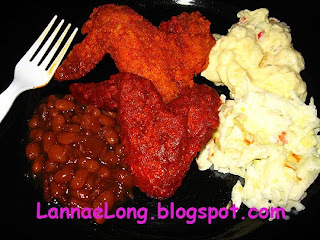 There is an underlying spice flavor to the hot chicken, not just spicy hot. I like the light crunchy fried chicken batter 400 Degrees uses. The hot chicken is not at all like saucy Buffalo wings, it is completely different with the spice and chili pepper flavors permeating through the chicken. Hot chicken is its own thing. I really like the flavor, color, texture and burn I can get at 400 Degrees. Here is the deal about this place, it is small with a couple tables and a counter with a couple chairs, so one is best to order over the phone and take out. Don't worry, the chicken will travel well to where you need to go. If you don't like spicy hot food, there are plenty of sides without spicy hotness, and hamburgers. I have never gotten a burger, I don't know how they are, but 400 Degrees was smart enough to put non-hot burgers on the the menu for the friends and family who just cannot take the heat. There is 0 degree chicken, which I have not tried either, but I am guessing it is just plain fried chicken.